A team of researchers associated with the Center for the Study of the First Americans (CSFA) at Texas A&M University observe that dispersal of Homo sapiens across the Americas is one of the greatest chapters in the history of our species, but major questions about this late Pleistocene diaspora remain unanswered. In a new scientific paper co-written by members of the team and published online in the the online version of the Journal of Archaeological Science, they note that two contentious issues are the timing of colonization of the Bering Land Bridge and origin of Clovis, which at 13,000 calendar years ago is the earliest unequivocal complex of archaeological sites in temperate North America, known by its specialized fluted spear points, and that the 2005 discovery of fluted spear points in northwest Alaska strongly suggests that early humans carrying American technology lived on the central Bering Land Bridge about 12,000 years ago, showing that peopling of the Americas was more complex than previously believed. The research team’s Alaska project is led by Texas A&M University professor of anthropology Ted Goebel, includes his TAMU colleagues Mike Waters, Heather Smith and Kelly Graf, as well as researchers from Baylor University, the University of Georgia, the National Park Service, the Bureau of Land Management and the Desert Research Institute was funded by the National Science Foundation, the National Geographic Society, and National Park Service’s Shared Beringia Heritage Program, observe that two contentious issues regarding migration of people to the Americas are the timing of colonization of the Bering Land Bridge, and the origin of Clovis 13,000 calendar years ago, which is the earliest unequivocal complex of archaeological sites in temperate North America, known by its specialized fluted spear points. They observe that one hypothesis holds that spear point fluting technology emerged in Beringia, and then was carried southward, with fluted points becoming the diagnostic “calling card” of early Paleoindians spreading across the Western Hemisphere. Fluted points have long been known from Alaska, yet until now they have never been found in a datable geologic context, making their relationship to Clovis a mystery. In the paper, the researchers show that a new archaeological site at Serpentine Hot Springs in Alaska’s Bering Land Bridge National Preserve, contains fluted points in a stratified geologic deposit dating to no earlier than 12,400 calendar years ago, and that these results suggest that Alaska’s fluted-point complex is too young to be ancestral to Clovis, and that it instead represents either a south-to-north dispersal of early Americans or transmission of fluting technology from temperate North America, which in turn suggests that peopling of the Americas and development of Paleoindian technology were much more complex than traditional models predict. 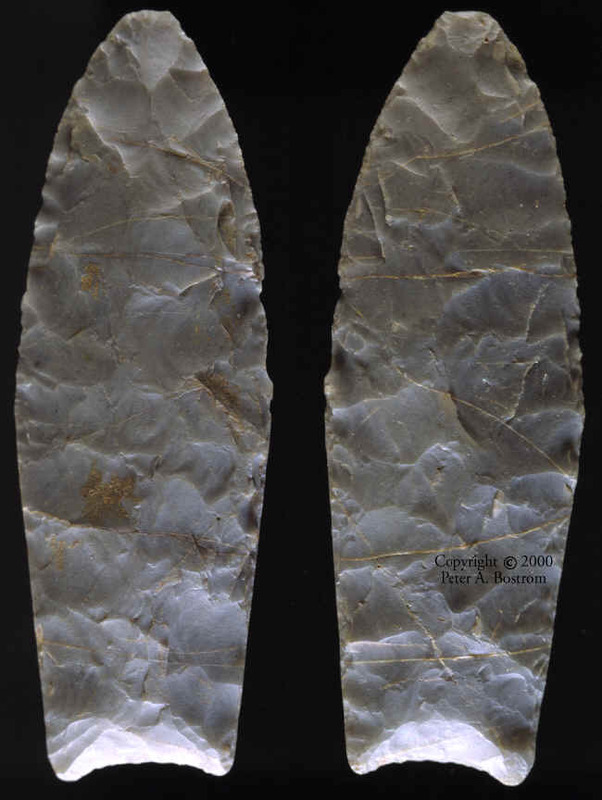 The researchers focused on the Serpentine Hot Springs site, now part of the Bering Land Bridge National Preserve, located on the Seward Peninsula, where in 2005 park archaeologists discovered a fragment of a fluted spear point, an artifact long associated with North American Paleoindian cultures. Dr. Goebel and the team later excavated the site, finding more fluted points.